Comments Off on Home Values Show Increase, Signs of Recovery? This week was marked by several indexes showing similar gains in housing prices, a change that every home owner has been waiting for and a sign that the summer housing market is moving in a positive direction. 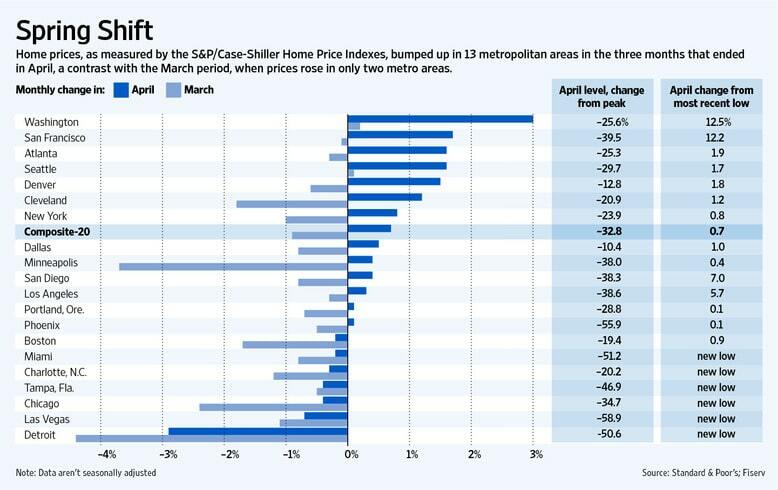 The Case-Schiller index, which is a measure of of home-value is calculated from repeat sales of single-family homes (as opposed to relying on median home prices) showed that home values rose 0.8 percent for the 10-city index and 0.7 percent for the 20-city measure when compared with March. Similarly, the Federal Housing Finance Agency’s monthly House Price Index (FHFA Index) shows U.S. home prices rose 0.8 percent on a seasonally-adjusted basis from March to April. The FHFA monthly index is calculated using purchase prices of houses backing mortgages that have been sold to or guaranteed by Fannie Mae or Freddie Mac. Finally, the National Association of Realtors Pending Home Sales Index (PHSI) showed growth of 8.2% month over month, which is 13.4% higher than May 2010. It is also worth noting that this is the single largest gain since November 2010. NAR’s Pending Home Sales Index (PHSI) is released during the first week of each month. It is designed to be a leading indicator of housing activity. If you are considering purchasing a new home but aren’t sure how much you qualify for, we can help. Now is a great time to take advantage of historically low rates, waiting may result in having to pay more for a higher rate, so don’t hesitate with any questions you might have. Have a happy and safe 4th of July!